Entirely eliminate added sugars from the diets of children 0-2 years. 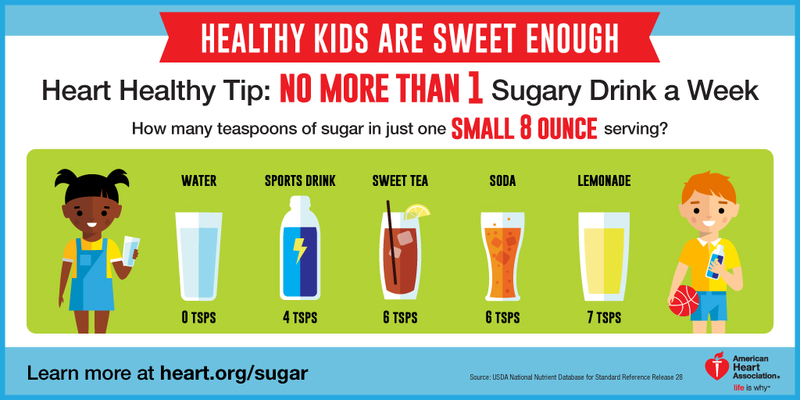 Limit children 2-18 years to a maximum of six teaspoons of sugar (25 grams) per day. Limit the sugary drink consumption of children two years and older to eight ounces (one cup) per week. It’s fair to say that the science directly linking childhood sugar intake to heart attacks in adults is not rock solid. However, added sugar intake is associated with obesity, which in turn is a risk factor for prediabetes and diabetes itself. People with diabetes have a two-to-three-fold increased risk of heart disease. So while the views of doctors, scientists and the general public vary greatly (with upcoming ballots across the US set to ask voters for their support or opposition for a sugar sweetened beverage tax, for example), the AHA recommendation comes as a strong statement from a large, national health association. The term “added” sugar encompasses any type of sugar – including honey, table sugar, and fructose – that is used to supplement natural foods either during processing or preparation. In other words, it doesn’t include fruit. The AHA notes that sugar-sweetened beverages like soda, sports drinks, and energy drinks are common sources of added sugars; they also specify that natural sugars, like those in 100 percent fruit juices, are not as well understood and do not fall under the recommended childhood intake limit at this time. While tracking the amounts of added sugars in food and drink may be difficult for parents for at least the next year (food manufacturers are not required to label the amount of “added sugar” in products until July 2018), AHA emphasizes that food preferences are formed early in life and parents should try to follow its added sugar-limiting recommendations right away. Until Nutrition Facts Panels across the US include added sugar information, the AHA suggests parents rely on the following reference table to guide added sugar consumption for their children. The organization advises a daily maximum of 100 calories (25 grams) of added sugar for children 2-18 and 0 calories for children younger than 2 years.